Blender Culture is manufactured at Organic by Nature which is a Good manufacturing practices and Organic certified & Kosher facility. Organic By Nature, Inc. entered the health food/supplement industry in 1993 as the Green Kamut Corporation. The Green Kamut Corporation quickly became recognized for setting a new standard of purity, potency and cutting edge plant based nutritional products. Rejecting the trend toward mega-dosages of vitamins and minerals, Organic by Nature, Inc. focused on finding nature’s most potent natural source of phyto-nutrients and revolutionized the way they are concentrated into non-pasteurized stable powders. Along with an extensive list of raw material offerings, we now offer contract manufacturing services. Following the tradition of high quality offerings, our contract manufacturing services takes place in our GMP and Organic certified facility. Today, over 200 companies (such as Blender Culture) trust OBN to provide them with private label products, packaging services and raw materials. We understand the time sensitive nature of contract manufacturing and have gathered a talented pool of professionals to run our advanced equipments and facility. Our GMP-compliant and dedicated staff collectively provides experience from all facets of the health industry and product knowledge that is so critical in producing high quality products. From product conception, formulation, sourcing raw materials, blending and packaging, we can confidently fulfill your custom manufacturing needs. With various sized ribbon blenders, Organic By Nature, Inc. has the flexibility to accommodate regular size and large size blending projects proficiently. Our trained staffs have many years of experience and can expertly accommodate the most complex formulas. Strict Quality Control verifies the identity and consistency of the blended materials. With multiple product offerings on the market, consisting of over 50 unique products, Organic By Nature, Inc. has the experience and knowledge to take the guesswork out of creating a new product or product line. Our team of experienced R&D and marketing staffs can formulate and develop prototype products for your marketing needs. Our computer-controlled auger fillers carefully measure the distribution of powder into each container. Utilizing 2 auger fillers per container allows lighter materials to compact in between the fillers. This unique process enables us to work very precisely with often-difficult “fluffy” materials. Our correct climate and moisture controlled facility ensures the freshness of the powder from bulk packaging into finished products. To ensure the highest quality, our fruit & vegetable powders are inspected and tested at multiple levels. These tests are conducted in-house and includes NEAR Infrared test for authenticity as well as batch consistency and Micro-biological analyses for purity. Our fruit and vegetable powders are available in organic certified, kosher certified as well as conventional grade. Along with the single ingredient offering for our products. Laboratory research on the health benefits of cereal grasses increased over the past two decades in the United States and Japan. 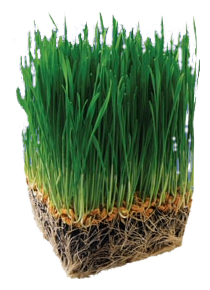 At the same time, the use of wheat grass as an alternative therapy for chronic diseases became popular. These two movements, together with the increased availability of suitably prepared American-grown cereal grass, have been responsible for a renaissance in the use of cereal grasses as human foods. Now technology allows us to offer the world's finest, 100% pure barley juice extract without any binders, fillers or preservatives. Organic Barley Green Juice™ is grown in pristine fields and watered with mineral springs to ensure it has nature’s maximum nutritional input. Organic Barley Grass Juice: Barley leaves contain all the vitamins, minerals, and proteins necessary for the human diet, plus chlorophyll, which is easily assimilated throughout the digestive tract, giving our bodies instant access to vital nutrients.